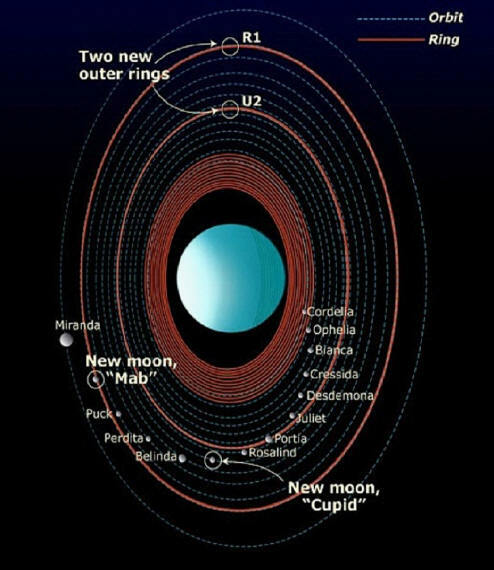 The rings and moons of Uranus. Credit: NASA, ESA, and A. Field of STScI. One of the largest planets in the Solar System is also one of the most enigmatic. Uranus is the coldest planet in the Solar System at -224° Celsius. The refrigerated dwarf Pluto is colder, but by consensus it has been relegated to the planetesimal category and no longer qualifies as a fully fledged planet. No one knows why Uranus is so cold—colder than its more remote neighbor Neptune at -214° Celsius. Neptune lies at a mean distance from the Sun of 4,504,300,000 kilometers and Uranus at 2,870,990,000 kilometers, so it receives four times less solar radiation. However, astronomers think that the low temperature anomaly on Uranus could be due to its rotational vector. Uranus is tipped on its side by 97° past vertical, prompting scientists to speculate that the gas giant was involved in a massive collision sometime in its early history. It is also thought that colliding with that other large object might have released much of its heat, although the precise mechanism for how a collision can cool down a planet remains a mystery. Uranus does not radiate a great deal of energy in the infrared wavelengths, so its interior is much colder than that of Jupiter, for instance. Based on observations by the Keck telescope, Jupiter's infrared signature corresponds to an internal temperature of approximately 29727° Celsius, whereas the internal temperature of Uranus is about 4727° Celsius. If the Sun were to disappear tomorrow, Jupiter would still be visible as a faint, reddish glow, but Uranus would be almost invisible against the black background of space. Like its other gas giant siblings, Uranus has a complex system of rings in orbit with a bevy of satellites. Currently, there are 27 known moons circling the planet, ranging in size from Miranda (470 kilometers in diameter) to Titania (1578 kilometers in diameter). The most unusual thing about the rings and moons is their placement. Uranus is revolving around the Sun while lying on its side, and its moons and rings are also orbiting along with it in the same orientation. Instead of circling the planet near the plane of the ecliptic, they are inclined from the vertical by 97°, perpendicular to the rest of the Solar System. However, there are several small moons that orbit in the "correct" angle of inclination, crossing from axial pole to axial pole, as well as moving in a retrograde fashion. Why this is so is not known, although it has been suggested that these moons were "captured" by Uranus and did not evolve with it out of a hypothetical nebular cloud. The rings of Uranus are similar to those around Saturn and Jupiter. Neptune possesses a system of rings as well, but they are thin and only partial, appearing more like ring segments or arcs than a complete set of bracelets. There are at least 13 rings around Uranus, with the potential for more as the refurbished Hubble Space Telescope turns its new eyes on the planet. The magnetic field generated by Uranus is probably the most unusual aspect of a planet whose structure is dominated by eccentricities. Unlike Saturn, whose magnetic poles are aligned almost exactly with its axial poles, or Jupiter, whose field is offset from vertical by a mere 10°, the magnetic poles of Uranus are offset at a slant from its rotational axis by 60°. Neptune exhibits a similar field offset, with the majority of the field strength concentrated in one hemisphere—like Uranus. Why Jupiter and Saturn have intense magnetic fields, while Uranus and Neptune have weak fields is not understood by conventional astronomers or by Electric Universe theorists. 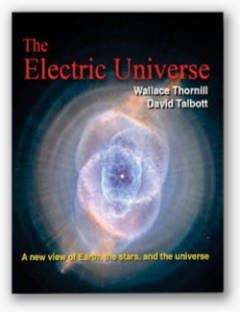 In the Electric Universe model, however, there is no dependence on internal composition, such as an iron core acting as a dynamo, or a compressed core of metallic hydrogen creating the field through rapid rotation. What is most likely occurring is that the rapid rotation of charged particles in the plasma making up the giant planets is creating a powerful surge of electromagnetic energy. 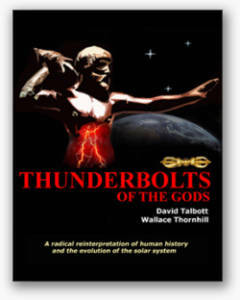 It is common knowledge that a rotating electrically charged body will produce a magnetic field. All four gas giant planets spin at enormous velocities for their sizes. Uranus is 51120 kilometers in diameter, yet it completes one rotation in just under 18 hours. 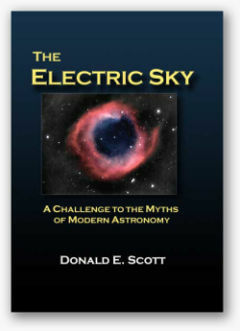 Recently, a current sheet was found connecting Uranus with its moon Miranda, feeding current into the auroral field, proving that there is an electric circuit within the Uranian system. In fact, the magnetosphere of Uranus extends out beyond its farthest moon and is wide enough to encompass its entire ring system. It is to be hoped that outlining the problems and anomalies associated with one of the coldest of the cold places in existence will motivate more interest and more investigation. We have made little attempt to explain what is found on Uranus because explanations have yet to be forthcoming—electrical conditions usually require in situ measurements. So far, only one space probe has visited Uranus, and the Earth-based telescopes on the ground and in orbit have just recently been upgraded to the point where sharper images can be synthesized. We can only wait for more data.